Wow. I have officially cut my hair short enough that you can no longer see in in my IMM vlogs. That's crazy! Especially considering that I used to be able to SIT on it. Once again, I made both a vlog and picture version of this IMM so you can choose which you prefer. Picture is below vlog, links are below picture! I've been trying to hold the books still while I dance in the video, but this song was so happy that I slipped up a couple times. Enjoy! Wow! That's a lot of books!! Kind of envious that publishers give you so many! 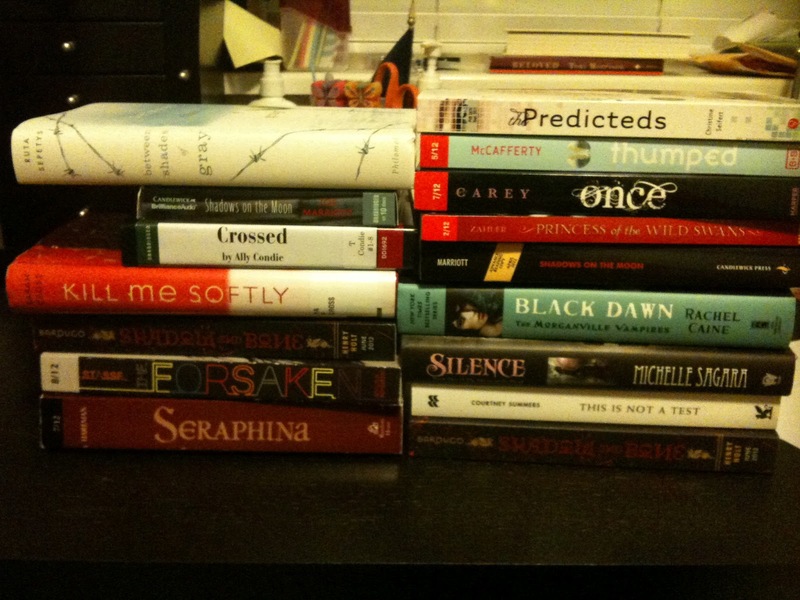 Of course I still have a ton in my TBR pile anyway! Happy Reading! My book haul for the week will be posted tomorrow, so be sure to stop by then! what a great mailbox and can't for your reviews. I agree borrowing from friends are the best. I'm very excited for you to read Kill me Softly because I want to read it too! Once and Kill Me Softly...WANT!!! Awesome haul!!! I hope you enjoy Crossed. I have a hardcover copy but I still haven't gotten around to it. I hope to get to it soon though! Here's my IMM! oohh! Crossed on audio! I can't wait to see how to like it! Errr... see how YOU like it. I was looking forward to Kill me Softly, but now not so much. Can't wait to read your review and found out what was so strange about it. I'm waiting for Smoke and Bone to come in the mail. LOVE those books! I wanna read Once and Silence!!! Happy reading!